Learn more about the special features of the individual product lines and the material characteristics. These timeless modern bathtubs have a classical rectangular shape that can be easily integrated into any bathroom style. The overflow can be flexibly positioned in three positions - even in the middle for comfortable lying for two people. Thanks to the flexible material Quaryl®, a thickness of only 10 mm can be applied, which makes a slim line look possible. The drain and overflow set are available in white or chrome and can thus be installed according to individual taste or either a tone-in-tone look is created, or you set a clever accent in your bathtub. WHICH ADDITIONAL EQUIPMENT IS AVAILABLE? For even greater relaxation, you can also equip your Oberon bathtub with several additional features. These include the whirlpool system. Air or water nozzles or a combination of both can be selected. The AirPool system provides simulating massages and the HydroPool system for specific massages of the muscles. All whirl equipment is available in different versions. If you want to listen to music in the tub, you can choose the ViSound system and stream audio files via Bluetooth from your smartphone. An incomparable experience - because the bathtub itself becomes a loudspeaker thanks to structure-borne sound converters. Other optional features include handles at the bath edge, a wall mounted faucet and lighting systems for the inner bath basin. With these, you can conjure up your individual wellness oasis from your Oberon 2.0 bathtub. The Squaro bathtubs in minimalist design impress with their seamless appearance and appear to be made of one piece due to the seamless joint between bathtub and apron. This is made possible by the exclusive material Quaryl from Villeroy & Boch. With the central drain, bathing in pairs is also possible without disturbance. The inviting appearance and the optional color on demand accents allow the free-standing bathtub to be placed anywhere in the room and gives a good impression from every side. Make your bathtub safer with a handle at the edge of the bathtub. This gives you additional support when getting in and out and when sitting down and getting up and can be helpful at any age - whether for children or seniors. The handles are available as folding support rails or handles made out of brass or chrome. Another great feature is the ViSound system. Especially if you like listening to music in the tub, you will really enjoy this feature. Simply stream your favorite music directly into the bathtub via Bluetooth. The tub itself transforms into a resonator and ensures outstanding sound quality. Wie ein kleiner Waldsee schmiegt sich die freistehende Badewanne der Serie My Nature mit ihren naturhaften Rundungen in Ihr Badezimmer ein. Der Sockel aus natürlichem Holz unterstreicht die Naturoptik zusätzlich. Mit einer Größe von 1900 x 800 mm und einem mittigen Ablauf eignet sich die Wanne auch bestens für zwei Personen, die sich dank zweier abgeschrägter Seiten bequem gegenübersitzen können. Das Material Acryl sorgt dabei für ein angenehmes und warmes Hautgefühl. Für noch mehr Komfort in der Wanne bietet Villeroy & Boch optionale Zusatzfeatures an. Dazu gehört das ViSound, ein Soundsystem für die Badewanne. Per Bluetooth können Sie Ihre Lieblingsmusik einfach streamen und entspannt in der Badewanne hören. Dabei wird die Wanne selbst als Klangkörper verwendet und es entsteht immer ein perfektes Klangerlebnis, egal wie hoch der Wasserfüllstand ist. Ein weiteres Zubehör ist der Wannengriff, der Sie beim Ein- und Aussteigen oder beim Hinsetzen und Aufstehen unterstützt. Auch für Kinder kann ein solcher Griff sehr hilfreich sein. Mehr Informationen zur Serie und zu kompatiblen Produkten finden Sie auch in unserem Villeroy & Boch Markenshop. A true eye-catcher in the bathroom is the free-standing bathtub of the Finion series. With its optional light ring on the bottom of the bathtub, it brings atmospheric lighting into the bathroom - regardless of whether in combination with other lighting units or on its own and appears as if it were floating on a light base. The size of 1700 x 700 mm and the duo shape with two slanted backrests is ideal for bathing together. Thanks to the narrow wall thickness of only 15 mm, a spacious inner space is provided. A push-to-open valve with overflow and water inlet is already pre-assembled. Here you can optionally choose the modern bicolor look and further chic accents, for example in gold, can also be chosen. The lighting of the bathtub, furniture and mirror can be controlled with a universal remote control (must be ordered separately). This is the emotion function, which can be dimmed continuously. The special concept of the series is also supported by many awards Finion has already received. Among them is the iF Design Award 2017. The bathtub is available in the two colors white alpin and star white and can be customized to your wishes by Color on Demand on request. More than 15 different colors are available for the skirt. In addition, a design ring in chrome, champagne or gold can be attached to the outer side of the bathtub to provide additional accents. The push-to-open valve can then also be selected in matching colors. WHAT ADDITIONAL EQUIPMENT IS POSSIBLE? The water inlet can be integrated directly into the overflow. This innovation is a special highlight in the modern bathroom and enables the tub to be filled quickly, as a high flow of water is possible. The fitting system thus remains almost invisible. Especially in modern wellness baths, a whirlpool may not be missing. The free-standing bathtubs of the Finion series can also be extended with a whirlpool system. Choose whether you prefer air or water nozzles or a combination of both. The systems are offered in the Entry and Comfort versions and in some cases have particularly quiet technology. For many people, music is also part of a relaxing bath. Optionally, you can equip your Finion bathtub with the ViSound sound system from Villeroy & Boch. Music is streamed via Bluetooth from compatible devices such as smartphones or tablets. The tub itself transforms into a resonator and ensures outstanding sound quality, regardless of material and filling level. More information about the series and compatible products can also be found in our Villeroy & Boch brand shop. Villeroy & Boch sets particular value on the materials of the free-standing bathtubs, because high-quality materials also support functionality, design and well-being positively. Find out which characteristics are associated with the individual materials. WHAT IS SO SPECIAL ABOUT QUARYL? Quaryl® consists of quartz and sanitary acrylic, which gives the material its name. The formability enables new designs in the bathroom industry and seamless shaped bathtubs. The smooth, poreless surface is easy to clean, which additionally supports jointless installation. 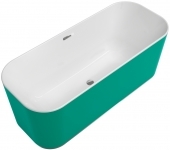 In addition, it provides perfect thermal insulation, which has a particularly pleasant effect on bathtubs. The sound absorption of the material and its scratch and impact resistance also contribute to a greater degree of comfort. WHAT IS SPECIAL ABOUT ACRYLIC AS A MATERIAL? Now, Villeroy & Boch has been working with acrylic for 45 years. The advantages are obvious. Acrylic feels particularly pleasant to the skin and has a warm feeling, which is why it is particularly suitable for bathtubs. In addition, the smooth surface is anti-slip. In addition, acrylic is easy to clean, and the color stays for a long time. 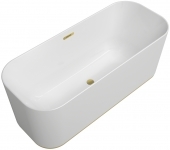 Acrylic bathtubs are break-proof and can be repaired easily without visible traces in the event of damage.